The days have shortened and the sun has lost some of its heat but the food larder just gets more interesting. Jars of jams, bottled beetroots, compotes and candied fruits all await their moment when, in the depth of winter, a twist of the wrist releases those heady summer fragrances. Apples and pears have arrived a little early this year, perfumed Norfolk Royal Russets and silky Red Beurre Hardy pears are amongst the first. Wet walnuts, sweet chestnuts in their spiky overcoats and luscious purple figs have arrived from France. Greengages and other plums have been fleeting this year but Damsons are still available for making into crumbles or Brown Betty. Ceps and chanterelles are appearing at market, the latter being particularly abundant right now and, consequently, well priced. Game birds and venison are plentiful, and cuts of pork come back into favour, all pairing well with our varied autumn fruits. 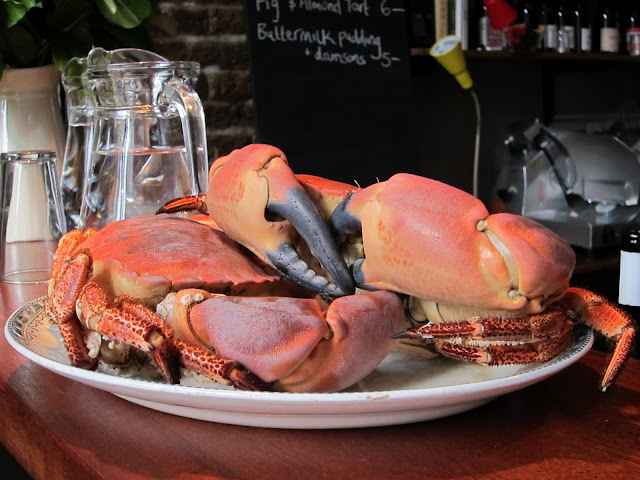 The photograph above of a dish of crabs on the bar at Gergovie Wines (now additionally open Thursday evenings) at the weekend speaks for the beauty of our shellfish at this time. Simply boiled and served with mayonnaise as it was here, it beats lobster hands-down for me. According to Fergus Henderson, cooking time (from boiling point) is roughly 15 minutes for the first 500g then 5 minutes per further 500g. He also warns against boiling your crab in insufficiently salty water (it "must be as salty as the sea") or it can result in a wet flesh to the crab. Jane Grigson advises salting the water until an egg will float. When cold, pull away the main shell and remove the fluffy greyish gills either side of the body (the' dead mens' fingers') and discard. St John Bread and Wine serve a deliciously simple dish of brown crabmeat on toast with mayonnaise, which requires only a squeeze of lemon to make it perfect. As September rolls on, pumpkins and squashes are just beginning to make an appearance, but let's not rush things. The mellow days of autumn have only just begun.